In a wide non stick pan heat oil. Once hot add the whole spices one by one starting from bay leaf, cinnamon cardamom, cloves. Once they release aroma add the onions and saute for 3-4 minutes until transparent. Add the ginger garlic paste and let it cook until raw smell goes away this will take 4 minutes. Now add the tomato and let it cook for 4 minutes until it turns mushy. Add the spice powders coriander powder, red chili powder and salt, add little of the water from cooked mutton and cook covered until spices blend well. 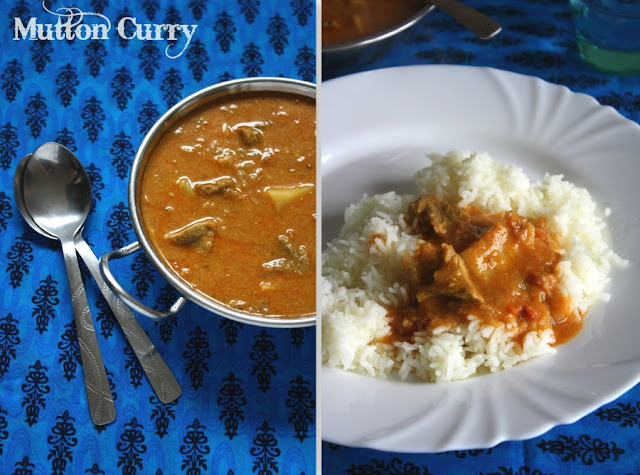 - This curry stays good for unto 3 days and can be reheated before meals. - Increase of decrease the use of red chili powder as per your heat tolerance. Wow! mouth watering here..Pass me that plate..
my mom also makes it similar priya.. what a torture u are giving me now :( couldn't even taste it..
Super mutton kuzhambu, I just love it. Wish I was there to eat it. never tried mutton with coconut Priya. thanks for sharing this.nice pics. Hi Priya, I emailed you through your contact page the other day regarding an article I'm writing (I'm a freelance journalist). Did you get the email? If not, could you give me an alternative address to write to you? Thanks! 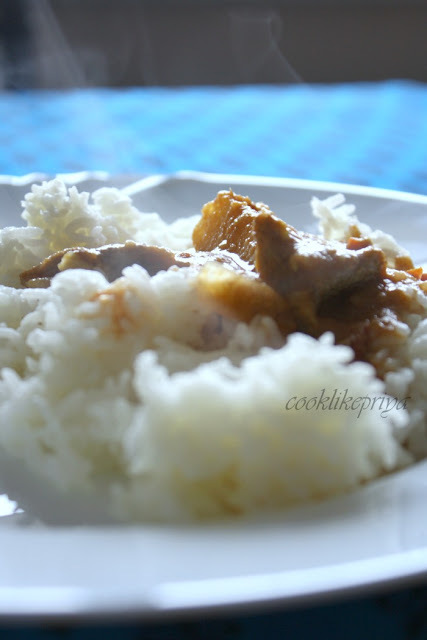 Yummyilicious and fingerlicking gravy, love to enjoy with a bowl of rice.Nothing will beat mom's dishes na. Drooling !! Such a perfect looking gravy :) Am hungry for some mutton now !! delicious and fantastic gravy,so tempting.nice clicks. killer post,Priya..am drooling over the mutton curry,yummy!!!! the curry looks absolutely divine..your mom must be a fabulous cook and you certainly have got her trait, Priya! Yes this will vanish in no time, best accompaniment with hot soft idlis...inviting clicks dear! 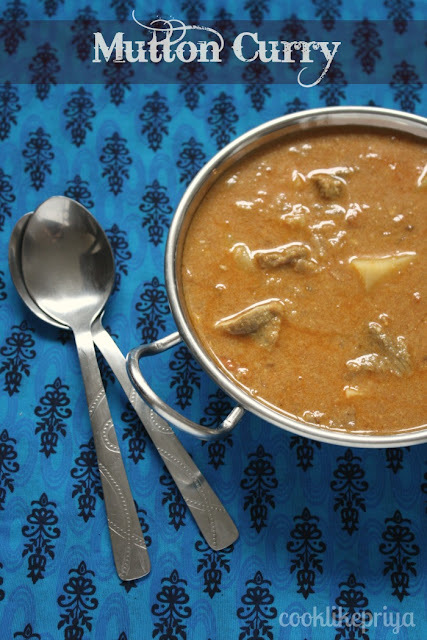 Delicious and flavorful mutton Kuzhambu.. Looks very inviting dear! Yummylicious kuzhambu!! love your header..